200% ATS – Ready to give 200%? We invite you to join us for the first Italian event entirely dedicated to the art and culture of the American tribal Style®. Three days to celebrate with us the tribal spirit through workshops, shows and lectures with the most important and innovative artists on the international scene. The next 200% ATS® edition will be presented in Milan on 8th, 9th and 10th February 2019. The history of the tribal cultures of the world has always gone through their countless migrations. From region to region, from village to village, cultures have influenced each other by absorbing the dances, traditions and folklore of those areas, creating new ones in turn. 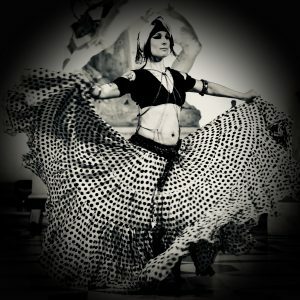 The tribal bellydance dance is a fusion of all these styles whose dominant characteristic is group improvisation through signals, coded steps and formations. The American Tribal Style® celebrates the strength and beauty of women by making them work together as a group. Pre-set steps, signals, visual contact and familiarity with musical phrasing allow dancers to stitch together an improvised canvas every time they dance. The growing popularity of this style, the importance it has as a founding element of the Tribal Fusion bellydance (for all artists, professionals and amateurs who recognize themselves in this definition), the ethical values ​​that are promoted and the historical, anthropological research and stylistics on which it was founded by Caroleena Nericcio Bohlman now more than 30 years ago, has created in us the desire to create the first Italian event completely and exclusively dedicated to ATS®. Taking advantage of the collaboration of important local and international artists, we want to give the possibility to the dancers to expand their baggage admiring the performances in the showcases and profiting from the high level of their preparation in the workshops but above all, we want to involve everyone indiscriminately in the spirit of community ‘dell’ATS® intended as “social” dance, so the shows and moments of meeting will not take place in the formal seat of a theater but in public places frequented by people of all kinds. We want to spread and make known more and more for us this very important form of art and communication.